Mount Nyiragongo is a stratovolcano in the Virunga Mountains associated with the Albertine Rift. It is located inside Virunga National Park, in the Democratic Republic of the Congo, about 20 km north of the town of Goma and Lake Kivu and just west of the border with Rwanda. The main crater is about two km wide and usually contains a lava lake. The crater presently has two distinct cooled lava benches within the crater walls - one at about 3175m (10,400 ft) and a lower one at about 2975 m (9800 ft). 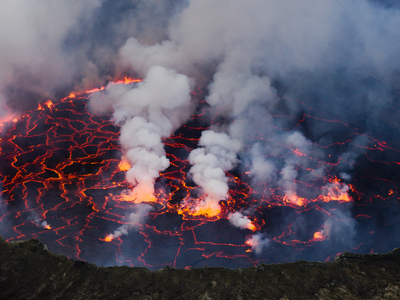 Nyiragongo's lava lake has at times been the most voluminous known lava lake in recent history. The depth of the lava lake varies considerably. A maximum elevation of the lava lake was recorded at about 3250 m (10,700 ft) prior to the January 1977 eruption - a lake depth of about 600 m (2000 ft). A recent very low elevation of the lava lake was recorded at about 2700 m (8800 ft). Nyiragongo and nearby Nyamuragira are together responsible for 40% of Africa's historical volcanic eruptions. Not much is known about how long the volcano has been erupting, but since 1882, it has erupted at least 34 times, including many periods where activity was continuous for years at a time, often in the form of a churning lava lake in the crater. 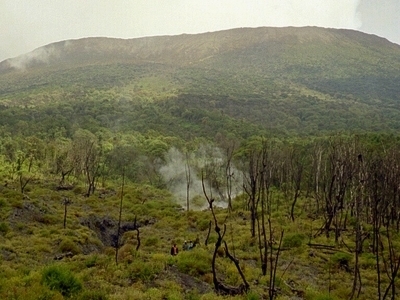 The volcano partly overlaps with two older volcanoes, Baratu and Shaheru, and is also surrounded by hundreds of small volcanic cinder cones from flank eruptions. Volcanism at Nyiragongo is caused by the rifting of the Earth's crust where two parts of the African Plate are breaking apart. A hot spot is probably also partly responsible for the great activity at Nyiragongo and Nyamuragira.The lava emitted in eruptions at Nyiragongo is often unusually fluid. Nyiragongo's lavas are made of melilite nephelinite, an alkali-rich type of volcanic rock whose unusual chemical composition may be a factor in the unusual fluidity of the lavas there. Whereas most lava flows move rather slowly and rarely pose a danger to human life, Nyiragongo's lava flows may race downhill at up to 60 miles per hour (up to 100 km/h). This is because of the extremely low silica content (the lava is mafic). Hawaiian volcanic eruptions are also characterised by lavas with low silica content, but the Hawaiian volcanoes are broad, shallow-sloped shield volcanoes in contrast to the steep-sided cone of Nyiragongo, and the silica content is high enough to slow most Hawaiian flows to walking pace.The lava lake activity continued through 2010.At present, the lake is mostly confined within a broad, steep-sided cinder cone on the crater floor, roughly 60 feet high by 600 feet wide. Here's the our members favorite photos of "Volcanoes near Virunga Mountains". Upload your photo of Mount Nyiragongo! Get in touch with 3 Touristlink members who want to visit Mount Nyiragongo or with Shaun Sendyowa, Umubano-tours and 3 others who already have been here.